Energy burden, the percent of a person’s income spent on energy (electricity, home heating, and transportation), is one of the better metrics we have to measure affordability. In an earlier blog, I took a look at electricity affordability, looking only at electricity bills, leaving out other energy costs like those to heat a home with a gas or oil furnace. The data was also limited to looking at averages, which can obscure the burden energy costs place on low and moderate-income (LMI) folks. While those households tend to use less energy than the average household, LMI households also make less, so the energy burden for LMI folks tends to be above average. In this blog, I’m able to expand the scope of my analysis thanks to data from the National Renewable Energy Laboratory, or NREL. My original post only looked only at electricity. Similarly, the map on the right is the estimated electricity bill of LMI households by county. On the left, is the estimated home heating fuel bill of LMI households by county. LMI is defined here as 0% to 80% of area median income. Both maps show the average household expenditures ($/month) for LMI households, at the county level. On the right is only electricity expenditures and on the left is only home heating fuel expenditures. Both choropleth scales reflect $<80/month for the lightest color and >$160/month for the darkest shades. Looking at these maps side by side, you might be tricked to thinking the energy burden is distributed evenly across the United States: with a higher electricity burden in the Southeast and a higher home heating burden in the rest of the US, it all balances out. Right? Energy burdens (at the county level) for LMI households. The lightest color in the choropleth scale is <6% of annual income spent on housing energy bills, and the darkest is >19%. Energy burden isn’t distributed equally across the US, as the map below shows. Appalachia lights up on the orange-colored map, with parts of Pennsylvania, West Virginia, Virginia, Kentucky and Tennessee all experiencing high energy burden. Why? The energy burden issue is complicated. The data shows significant energy burdens felt by communities in the Gulf Coast and Southeast, with clusters spanning Louisiana, Mississippi, Alabama, Georgia, and north Florida, up through the Carolinas. These areas experience high energy burden driven mostly by electric bills. The Northeast area also sees hot spots of decreased energy affordability, which is mostly driven by home heating expenses. Sometimes it is electric bills, sometimes it is home heating (gas and oil) bills, and sometimes it is both. Okay, so energy burden is a problem; what’s a policymaker to do? The good news is we have two resources that are well equipped to help reduce customers’ bills. Both these solutions I noted in the original blog and just so happen to have been evaluated by NREL. Energy efficiency can take many forms, from replacing incandescent bulbs with LEDs to in installing home insulation. Efficiency reduces home energy consumption and, as a direct result, reduces monthly bills. Average energy bill savings for the cost-effective package of efficiency upgrades, at the county level, for LMI households. Lightest color means <$100 in annual savings and darkest color indicates >$1,000 / year. Grey = data unavailable. In this green-colored map, the darker the green represents greater potential savings for LMI households. Note the tremendous amount of efficiency potential in states like California, Arizona, New Mexico, Texas, Colorado, Nebraska, Kansas, Oklahoma, Arkansas, Louisiana, Mississippi, Illinois, Indiana, Ohio, Tennessee, Georgia, Florida, Massachusetts, Maryland, New York, and really… everywhere. The potential for LMI households to save some green by investing in energy efficiency is widespread, with cost-effective savings in nearly every county where there is available data. Solar panels can be installed on or near LMI households and with the right policies can be used to reduce the bills of LMI households. One great example of such a policy is DC’s Solar For All program, which helps improve LMI households’ access to solar. The lightest color in the choropleth scale represents LMI household bill savings of less than $800 per year, and the darkest is >$1,600/year. Some of the areas with the greatest potential for bill reductions (darker teal) are in places you’d expect, like California, Texas, Arizona, and New Mexico. These are all states where the sun is shining and where households often see higher electricity bills. Kansas, a state I spent many formative years, lit up, much to my surprise. Also surprising: Michigan’s Upper Peninsula. The high potential for consumer savings isn’t just a function of the number of sunny days a state has, but also the building stock and energy consumption patterns. Parts of Maryland, New Jersey, New York (notably Long Island), Connecticut, Massachusetts, Vermont, and New Hampshire also showed up as places where LMI households could reduce home energy bills by hundreds of dollars a month with judicious applications of solar. Even the places that don’t show up on the map as the hottest of hot spots were still significant. Florida doesn’t look that great when compared to say, California, but, most of Florida’s LMI customers could see savings in the $800-$1,400 per year range. That’s a lot of money. How will this change with climate change? One more angle on this to consider is the impact of climate change. A recent analysis (and accompanying graphic) released by National Oceanic and Atmospheric Administration and based on data from the Climate Impact Lab, showed how the US energy burden will worsen over time, in many states, if we don’t rapidly reduce carbon emissions. The southern parts of the United States, already burned by energy bills, will be hit very hard. Communities in these states will have higher energy costs. This analysis suggests that climate change will exacerbate the existing energy burden. Interestingly, renewable energy and energy efficiency can play a role in staving off both climate change and the energy burden. NREL’s latest data confirms what utility practitioners have known for a while: LMI households in most parts of the US are well positioned to reduce their energy bills with energy efficiency and solar. Energy efficiency and solar policy alone won’t solve the issue of energy burden for LMI households, but it will make their energy burden less bad. In this blog, I expanded the scope of my original analysis by digging in on some new (to me) data. I want to thank the great staff of DOE’s office of renewable energy and energy efficiency for pointing me in the data’s direction. Maybe I’ll get my hand on some good transportation cost data, and if you know where I can find some, hit me up on twitter? The latest data comes from one of the US Department of Energy’s fine national labs (the National Renewable Energy Laboratory, or NREL) and it is all assembled in a great interactive map. A big thanks to the find staff of NREL. NREL’s latest data is aggregated at the county level which made it difficult to turn into a table or provide clear data labels on the maps above. If you’d like to know more or zoom in on the data, you can find the map and the underlining data: here. Have fun digging in. California saw three big plant retirements last year: Encina (854 MW), Mandalay (560 MW), and Etiwanda (640 MW). The retirement of Encina and Mandalay was no surprise – those two plants used ocean water for cooling, and California has been phasing out plants that use that cooling technology because of its harmful effects on marine life. On the other hand, Etiwanda shut down simply because it was not making enough money. While California has figured out solutions to keep the electric grid operating reliably without the Mandalay and Etiwanda power plants, Encina is being replaced by the Carlsbad Energy Center, a new 500 MW natural gas power plant. These retirements in 2018 continue California’s downward trend in natural gas power plant capacity. California’s gas fleet peaked in 2013 with just over 47,000 MW of gas capacity, but California has shed roughly 5,000 MW of gas capacity since then. California’s gas fleet is shrinking because many natural gas power plants just cannot make enough money to stay open. Since 2012, California has added roughly 20,000 MW of wind and solar to the grid, and these renewables are generating electricity that otherwise would have been generated by natural gas power plants. Since there is less demand for electricity from gas plants, some plants are shutting down for good. Looking forward, California is expecting many more retirements in the years to come. Another 1,380 MW of natural gas power plant capacity is expected to be retired in 2019, and another 4,600 MW of gas capacity is expected to be retired in 2020. Will these retired gas plants be replaced by brand new gas plants? It’s not looking likely. There are only a couple thousand megawatts of new natural gas power plants under construction in California. In addition, Los Angeles recently decided not to rebuild a couple of outdated natural gas power plants, opting to invest in renewables and storage instead. California’s gas fleet is poised to continue its decline over the next few years. At the end of the day, these retirements are not unexpected. Recent analysis from the Union of Concerned Scientists has shown that California can retire a significant amount of natural gas power plant capacity while continuing reliable operation of the electric grid. Nevertheless, this is good news as California adopts increasingly ambitious global warming emissions reduction goals. California is continuing to head in the right direction – as the state adds more and more wind and solar to the grid, California’s electricity sector is gradually weaning itself off fossil fuels, downsizing its gas fleet one plant at a time. In New Mexico, out of the crucible of power-sector transformation, economic vision, and climate imperative comes SB 489, the Energy Transition Act, a bold proposal to set a predominantly coal-fired state down a clean energy path. Critically, SB 489 balances the urgent hunger for what could be—clear skies, bright futures, good jobs that are built to last—with the inescapable reality of that which is—more than half a century of dependence on coal—by ambitiously committing the state to a forward course while simultaneously reckoning with its past. With the arrival of a new governor, New Mexico’s clean energy potential has swiftly snapped into focus after long seeming just out of reach. But vision is one thing, reality is another, and it takes a plan to navigate the liminal space. SB 489 offers that response. It’s big and it’s bold, setting a power-sector target of 100 percent carbon-free electricity by midcentury, but it’s also careful and considered, looking out for the jobs and economies that were, and shaping for the better the jobs and economies that will be. SB 489 is supported by environmental, community, labor, and conservation groups, and has the full backing of the governor. It is the right plan, at the right time, for a state on the precipice of change. As recently as two years ago, PNM, the state’s largest utility, was fighting to keep coal-fired San Juan Generating Station (SJGS) running through 2053. Now PNM is planning to close SJGS by 2022, and leave coal entirely by 2031. The fact is, SJGS costs more to keep running than building new resources to take its place. PNM estimates that were it to keep SJGS running for another 20 years, it could cost its customers tens to hundreds of millions of dollars more. But an exit from coal is not as straightforward as simply snuffing out the stacks. The legacy of coal runs deep. Investments have been made, careers have been built, economies have been centered—and the transition at hand upends all of that. The departure from coal demands real leadership; officials willing to wrestle with hard truths rather than ducking reality and pretending change won’t come. And that takes leadership now—before plants and mines have closed, before that opportunity has passed. That takes supporting a proposal like SB 489. SB 489 begins with the recognition that coal plants are closing and then determines how best to act. It does this by tackling two major fronts: first, how best to protect ratepayers while retiring coal, and second, how best to address the needs of workers and communities at risk of being left behind. As it currently stands, PNM, a regulated utility, earns a profit of approximately $16 million a year on $320 million in outstanding investments at SJGS, paid by utility customers. When these investments were approved, the intention was that the plant would operate well into the future, and thus those costs could be recovered over a long period of time. Now, even abandoned, those debts must still be paid. Traditionally, the utility would go to the Public Regulation Commission (PRC) and seek cost recovery, which would allow them to continue to earn a return on investment for the amount approved. This would likely result in a lengthy legal battle over just how much should be borne by ratepayers, and just how much by shareholders. SB 489 provides an alternative to that by adding a new tool to the PRC’s regulatory toolbox: securitization. Securitization works like refinancing a loan; by gaining access to AAA-rated bonds, PNM would be able to secure much lower-cost financing to cover outstanding plant, worker, and facility debts. In the process, the utility avoids taking a write-off but also forgoes earning returns. Customers could stand to save as much as 40 percent via this form of plant closure, which frees up capital to advance workforce transition and economic development efforts. Of course, that “could” is crucial: baked into SB 489 is a requirement that the PRC only approve such a proposal if it guarantees ratepayers a certain amount of savings—and the bill provides funding for them to hire an expert to ensure such savings are the case. At the end of the day, this approach embraces compromise as a means of moving forward; it looks to unite state, customer, and utility interests under single cover, working to navigate a viable path out of the deep and tangled morass. Concurrently, SB 489 works to support the transition ahead for those coal threatens to leave behind. SB 489 dispenses with the myth that the only way to shift from coal is to forsake jobs and local economies. That false choice, which dishonestly perpetuates hope for a commodity teetering on the brink of collapse, has done nothing to ready those at risk. It has done nothing to tackle severance, retraining, reclamation, or economic development. It has done nothing to tackle reality. First, the proposal would set aside $20 million for severance and job training for employees losing their jobs. Importantly, this covers not just plant workers, but mine workers, too; the mine serving SJGS only serves SJGS, and its owner is presently in bankruptcy—these workers need significant and dedicated support. SB 489 would put approximately $15 million more into an Energy Transition Displaced Worker Assistance Fund, to be administered by the state’s Workforce Solutions Department, to further assist in workforce training. In addition, SB 489 requires that starting in 2020, a growing share of electricity generation projects host apprenticeships, thereby driving the development of a skilled workforce trained for good jobs that are built to last. Second, SB 489 would set aside $30 million for plant decommissioning and mine reclamation costs. This is not a limit; it simply secures the first $30 million via the securitization mechanism. Careful and thorough decommissioning and reclamation are essential for enabling the area to move beyond its coal-fired past. At the same time, these activities have the potential to create good jobs, with overlapping skillsets, for many years to come. Thoughtful planning for how to leverage this critical undertaking can further benefit the local economy. Finally, SB 489 relieves the community of being backed into the untenable position of fighting for something they know won’t last simply because it’s the only option they’ve got. SB 489 approaches this in two ways. First, it allocates over $5 million to an Energy Transition Economic Development Assistance Fund, to be administered by the state’s Economic Development Department in concert with community input, to foster economic development in the area. Second, by leveraging the area’s existing energy infrastructure, SB 489 directly addresses the expected erosion of the local tax base by directing replacement power to be located in the affected school district. This action could be significant; a recent analysis found that building a 450 MW solar plant in the area could replace all lost property tax revenue, as well as generate thousands of construction jobs and generate tens of millions more in additional state and local taxes. Facilitating the transition away from coal is only part of the story; it does not address what comes in to take coal’s place. And that affects everything that comes next for the state, because as goes coal today, so goes natural gas tomorrow. New Mexico cannot allow for its shift from coal to become a shift to gas. The risks of natural gas overreliance are significant, and largely borne on the backs of ratepayers. What’s more, a portfolio dominated by renewables has been repeatedly shown to be the most cost-effective option for the state. And that makes SB 489’s concomitant strengthening of the state’s Renewable Portfolio Standard (RPS) so critically important. By building from existing policy, SB 489 steadily strengthens renewable resource requirements from 20 percent by 2020 to 50 percent by 2030 and 80 percent by 2040 for large utilities, and 80 percent by 2050 for co-ops. But SB 489 doesn’t stop there. It further commits to a power sector 100 percent carbon-free come 2045 for the utilities, and 2050 for the co-ops. Which means that every investment decision that gets made from here on out will now be evaluated in the context of this carbon-free energy course. It makes clear where the state is headed, and requires utilities to fall in line. This is a major achievement, made all the more remarkable by the fact that it’s supported by utilities and co-ops alike. SB 489 offers a clear and convincing roadmap to navigating the transition ahead. Critically, essentially, it begins not by leaping to where the state is going, but instead by reckoning with where it’s been. It is considerate of those the transition away from coal risks leaving behind, and works to ensure that they’re readied to be a part of what’s to come. And with SB 489, the state’s future looks bright. SB 489 boldly commits New Mexico to a rapid power transition, positioning the state as a renewable energy leader and signaling to forward-looking companies that this is a place to invest. SB 489 doesn’t solve it all. The transition to a clean energy economy will take efforts large and small, ground-up solutions alongside top-down guidance and everything in-between. But SB 489 is a powerful place to start, and with major long-lasting investment decisions looming on the horizon, now is the time to begin. La ceremonia de los Grammys 2019 empezó con una energizante presentación de Camila Cabello (cubanoamericana), Ricky Martin (puertorriqueño) y J Balvin (colombiano). Fue muy emocionante ver a latinos abriendo por primera vez uno de los eventos más importante de la industria musical. Si bien la presentación me hizo recordar la increíble riqueza musical de los artistas de Latinoamérica y el Caribe (LAC), la región también cuenta con una impresionante riqueza en recursos naturales como el sol y el viento para generar energía. Mas, ¿qué metas están llevando a que esta riqueza sea aprovechada? Acá les cuento. Los precios de la energía solar y la energía eólica han bajado considerablemente y su adopción ha aumentado casi que exponencialmente en toda Latinoamérica y el Caribe. Adicional a la reducción en costos, un componente vital en la transición de combustibles fósiles a fuentes de energía limpia es el liderazgo de los gobiernos. De aquí que las metas que estos establecen en cuanto a reducción de emisiones de cambio climático e integración de energías limpias son vitales para la definición de políticas públicas que apoyen el logro de dichas metas. Costa Rica anunció en mayo del 2018 que para el año 2021 abolirá el uso de combustibles fósiles. Adicionalmente, por cuatro años consecutivos el país ha superado el 98% de generación renovable en su sistema eléctrico. México ya cubría en junio del 2018 el 24% de sus necesidad eléctricas a través de la generación con fuentes limpias y tiene por meta que el 50% de la electricidad deberá generarse con energía limpia para el año 2050. Jamaica ya cubre más del 18% de sus necesidades energéticas con energía renovable y tiene por meta generar el 50% de su electricidad usando energía renovable para el año 2030. Colombia busca tener al menos 500 megavatios (MW) de energía renovable no convencional para el 2022, o alrededor del 10% de la matriz energética. En la actualidad cuenta con 50 MW. Chile cuenta con la radiación solar más alta del mundo y fue elegido como el país más atractivo para invertir en energía renovable por ClimateScope en el 2018. Al final del mismo ya producía cerca del 20% de su energía usando fuentes renovables no convencionales, logrando llegar a la meta propuesta para el año 2025 casi 7 años antes. Uruguay, gracias a su proceso de reconversión energética, pasó de tener tan sólo un 1% de su energía generada por energía solar y eólica en el año 2013, a un 32% en el año 2017. La iniciativa Queremos Sol Puerto Rico, el Senado y el gobernador Rosselló presentaron propuestas en el 2018 para que el 100% de la electricidad provenga de energías renovables para el año 2050. La propuesta del Plan Integrado de Recursos presentada recientemente por la Autoridad de Energía Eléctrica (PREPA, por sus siglas en inglés) incluye más de 2000MW de energía solar y 1000MW de almacenamiento energético. El plan también contempla el desarrollo de múltiples microrredes para apoyar esfuerzos de resiliencia energética. El plan puede ser mejorado significativamente si refleja múltiples voces locales que piden se retire de la propuesta 3 terminales de gas. Latinoamérica y el Caribe se unen cada vez con más fuerza y entusiasmo al baile de la energía renovable, y esto es motivo de celebración. La transparencia, la transición justa y la participación comunitaria serán aspectos claves para hacer que este baile sea tan contagioso y energizante que todos podamos participar. Throughout the government shutdown in January, former oil lobbyist Bernhardt stayed on the job as Acting Secretary, working hard to push forward plans for oil drilling, including in the Arctic National Wildlife Refuge, and ensuring that the administration’s goal of “energy dominance” through opening new areas to fossil fuel extraction remained on track. During the shutdown, 800 employees of the Bureau of Land Management (BLM) were authorized to stay at work to process oil and gas drilling leases. Meanwhile 85% of the rest of the staff at the Department of the Interior (DOI) were furloughed, cutting off Native American healthcare programs, shuttering vital climate science research, and leaving national parks like Joshua Tree and Virginia’s civil war battlefields unprotected against vandalism and looting. What’s happening under Bernhardt’s watch in the remote Greater Chaco Area of northwestern New Mexico illustrates in microcosm why he is perhaps the worst possible choice for the job as top steward of our public lands. Chaco Canyon and thousands of Indigenous peoples’ sacred places and archaeological sites in the surrounding Greater Chaco Region are at risk from an unprecedented drive to frack and drill for oil and gas. The recent announcement (and then hurried withdrawal) of oil and gas lease sales within the 10-mile informal buffer zone for Chaco Culture National Historical Park shows Bernhardt’s intent, and that the land nearest to the park is not safe from oil and gas drilling. Existing drilling wells close to Chaco Canyon, and the proposed 10 mile protection zone (in blue). Map courtesy of WildEarth Guardians. Chaco Culture National Historical Park is centered on Chaco Canyon, which from around 850 C.E. to 1250 C.E. was the center of one of the most remarkable pre-Columbian cultures in the Americas. Chaco Canyon was among the first national monuments created by Theodore Roosevelt under the Antiquities Act in 1907. And in 1987, together with Aztec Ruins National Monument and five smaller “outlier” archaeological sites in the region, it was named a UNESCO World Heritage site. The Chaco culture evolved and spread in the region and its people left thousands of pueblos, shrines, burial sites, cliff-stairs, track-ways, and ancient roads. Eventually there were more than 200 outlier communities, many connected to Chaco Canyon by roads. All modern pueblo peoples trace their ancestry to Chaco Canyon, and tribes including the Navajo and Hopi claim cultural affiliation with the ancient Puebloans and Chacoans. Most of the Chaco region today is traditionally Navajo land. It’s a rough drive into Chaco Canyon. On the northern access road, the last 13 miles are on a pot-holed and dusty washboard road that can become impassable when it rains. The first thing you see on your left as you turn off NM 550 towards the park is a big fracking well, but as you get closer to Chaco, the landscape is flat and expansive, the desert scrub vegetation is sparse, and grazing cattle and horses are few and far between. The nearest town to Chaco Canyon is 60 miles away and there is no visitor accommodation, merely a campground frequented by coyotes and rattlesnakes under a mesa. It’s an International Dark Sky Park and you’d be crazy not to stumble out of your tent at night into the cool, high-desert air and marvel at the jewel-box-bright stars of the Milky Way spilling though the black-velvet night sky. Ancient Chacoans were closely connected to seasonal and astronomical cycles, and as you stand on mesa gazing at the night sky, you can’t help but be captivated by thoughts of how these ancient peoples connected with the same awesome spectacle. Today light pollution, associated with methane flaring from drilling sites that are creeping closer toward the park, is a real threat to the extraordinary dark sky views. Chaco’s a harsh environment: Bone-chillingly cold in winter, dry and sometimes searingly hot in the summer, and with an average of not much more than 9 inches of precipitation annually. But in these forbidding surroundings a remarkable and enduring culture formed and grew. Before Chaco, ancient pueblo people created hunting camps or small villages that lasted a few years, or at most a decade or two. But in Chaco Canyon a culture developed that put down roots and created extraordinary architecture and a complex trade network. Part of Pueblo Bonito, Chaco Canyon. Photo: Adam Markham. There are a dozen monumental, multi-story sandstone “great houses” in Chaco Canyon, and the remains of some are in remarkably good condition. Great houses contained store-rooms, granaries, offices, accommodations, circular ceremonial rooms called Kivas, and some probably had military barracks and aviaries for keeping or breeding rare birds. The most famous is Pueblo Bonito, which probably had at least 650 rooms. The great houses seem to have been occupied by an elite class, while the vast majority of ancient Puebloans lived in much simpler buildings. Archaeological evidence shows that the Chacoans participated in extensive trade networks involving copper, ceramics, turquoise, obsidian and chocolate throughout the Southwest and into Mesoamerica. From around 900AD, they were trading turquoise for scarlet macaws that originated in southern Mexico. The Greater Chaco Region is now under unprecedented assault by the oil and gas industry, with the enthusiastic support of the Trump administration and Acting Interior Secretary Bernhardt. According to WildEarth Guardians, there are already more than 20,000 oil and gas wells in the region, and the drilling is quickly encroaching closer and closer to Chaco Canyon. In early February 2019, BLM announced plans to sell more leases in late March (March 28) for oil and gas extraction, quite a number of which were within a 10-mile radius of the park. Then, a few days later, BLM announced that it was withdrawing the lease sales for sites within 10 miles of Chaco Canyon. This is a welcome development, but it is unlikely to be the last time that BLM tries to push drilling closer to the park. Archaeologist Paul Reed of the non-profit cultural resources advocacy group Archaeology Southwest says,“I think this is probably a temporary victory, and the parcels will come up again in a future lease sale…I encourage folks to contact BLM to protest the March 28 lease sale, even with the near Chaco parcels removed.” And according to the Society for American Archaeology, land parcels that are still up for lease outside the informal 10-mile buffer zone, but are within the Greater Chaco cultural landscape, also contain important Chachoan remains. The US non-profit advisory body for World Heritage, US/ICOMOS (US Committee of the International Council on Monuments and Sites) has also protested the expansion of lease sales in the Chaco landscape. Representatives of tribes, archaeologists, environmental advocates, and heritage experts are angry because planning for the new lease sales appears to have continued unimpeded during the recent government shutdown even though the Farmington Resource Management Plan and Environmental Impact Assessment (EIA) have not been completed. Oil and gas leasing in the area continues despite calls by the National Congress of American Indians (NCAI), the Navajo Nation, and the All Pueblo Council of Governors (APCG) for a moratorium on drilling in the whole Greater Chaco Region, pending initiation and completion by BLM and the Bureau of Indian Affairs (BIA) of an ethnographic study of cultural landscapes in the region. The study has not been initiated and new well openings continue apace. According to the NCAI, more than 400 new fracking wells have been approved in the region since 2013, and approximately 90% of federal lands in the oil- and gas-rich San Juan Basin, of which Chaco Canyon is the geographical center, have already been leased for drilling. For the protected ruins inside the park and associated protected areas, the primary impact of the expanded oil-shale drilling is from air, noise, and light pollution. But outside the park boundaries, the concrete drilling pads, massive rigs, pump jacks, and dense network of oil industry roads are damaging a huge sacred and cultural landscape left by the Chacoans, and about which we know very little. The burden of increased water and air pollution falls largely on Navajo communities who have little say in the leasing or management of BLM lands. In May 2018, Senators Tom Udall and Martin Heinrich introduced legislation to ban drilling and fracking on federal lands within 10 miles of the boundaries of the Chaco Culture park. The Chaco Cultural Area Protection Act is also supported by the APCG and the Navajo Nation. New Mexico Congresswoman Deb Haaland, the newly elected Chair of the House Subcommittee on National Parks, Forests & Public Lands, and a tribal citizen of Laguna Pueblo, dubbed the latest drilling leases proposed (and then quickly withdrawn) by BLM a “land grab”, lamenting the lack of consultation with tribes. David Bernhardt’s DOI is waving aside and ignoring the protests of tribes, Indigenous organizations, environmental groups, archaeologists, and New Mexico’s congressional representatives. Bernhardt, with his history of lobbying for drilling and mining interests, and his tangled thicket of conflicts of interest, seems not even slightly committed to the stewardship of public lands for the benefit of future generations, but only to the short-term benefits of the oil and gas industries. For this reason alone, he is not qualified to be confirmed as Secretary of the Interior. On Wednesday Governor J.B. Pritzker will give his first budget address as Illinois’s 43rd Governor. This is a key opportunity for him to address the financial benefits of renewable energy and a pathway for Illinois to achieve 100% carbon-free electricity. Last month Pritzker joined the U.S. Climate Alliance, a bipartisan coalition of governors committed to reducing greenhouse gas emissions consistent with the goals of the Paris Agreement. In his Budget Address Governor Pritzker should take the next step by laying out a plan to achieve his climate commitments. The governor would do well by referencing recent findings and recommendations from the Powering Illinois’ Future Committee and the Illinois Commerce Commission’s NextGrid study. It’s vital that his energy platform be an equitable path forward for the state. Here’s what we hope to see included. Earlier this month Governor Pritzker released a report from the Powering Illinois’ Future Committee, a committee co-chaired by Jen Walling, Executive Director of the Illinois Environmental Council. Ensure housing stock in Illinois is ready for energy efficiency upgrades and to prioritize older housing stock in low-income communities. Create clean energy empowerment zones in rural, transitioning, and communities of color to share in the economic and environmental benefits of Illinois’ shift to a clean energy economy. Through these zones, provide grants to facilitate locally-designed, community-directed clean energy initiatives. Expand electric vehicle charging infrastructure, by providing incentives for conversion of public transit and school buses and offer special rates to school districts that adopt EV buses. Integrate R&D efforts with business creation and compete for federal and private sector energy storage investments in Illinois. Incentivize projects at retired or soon-to-be retired coal plants to spur economic development in those transitioning communities. Support shovel ready solar projects for schools and state-owned properties. Implement the Solar for All program by initiating an additional 100 projects at publicly-owned properties in low-income communities. These recommendations should be the cornerstone of the Pritzker Administration’s policy platform and they should be included in his capital plan. Last year the Illinois Commerce Commission (ICC) launched NextGrid, the Illinois Utility of the Future Study. The study was a collaboration between key stakeholders to create a shared base of information on electric utility industry issues and opportunities around grid modernization. It was managed by the University of Illinois and consisted of seven working groups. UCS participated in two of the working groups, Regulatory and Environmental Policy Issues and Ratemaking. While still in draft form, the report does include three specific recommendations that the Pritzker Administration should use in the areas of electric vehicle charging infrastructure, deployment of energy storage resources to enable further integration of renewable energy, and proactiveness on protecting consumer data privacy. It is a missed opportunity that the NextGrid process did not result in a roadmap or larger set of policy recommendations for Illinois, but the report does identify areas where Illinois can move forward on policy changes to further the goals of a reliable, affordable, and carbon-free energy grid. The Draft Final Report does recognize that there is “very broad interest in active participation to mitigate climate change impacts in every possible way”. Participants shared the goal to make the grid greener through the continued integration of renewable energy resources to reduce emissions, and the desire to pursue sustainable ways to meet the state’s energy needs. There is an urgent need to respond to climate change by decarbonizing the electric grid and the many environmental and economic opportunities offered by advancing clean energy. The consensus points discussed throughout the process and laid out in the final draft report should be utilized by the Pritzker Administration. There is no time to waste. According to the Fourth National Climate Assessment projected changes in precipitation, coupled with rising extreme temperatures before mid-century will reduce Midwest agricultural productivity to 1980s levels without major technological advances. At the same time, we must swiftly and sharply reduce our global warming emissions, so we can avoid even worse impacts. Illinois deserves a healthy economy and environment where all communities can thrive. The Pritzker Administration has the capacity to innovate around carbon-free energy sources, while creating jobs and protecting the health of all Illinoisans. Governor Pritzker’s leadership on renewable energy and energy efficiency is crucial. During his campaign he stated that Illinois deserves clean air, clean water, and a safe environment where all communities can thrive. He said he stands on the side of science and believes climate change is real. Now is the time to put these campaign promises into action. The latest solar jobs census has just come out, and the news is… mixed. Here’s what the survey found, why the numbers are that way, and how we get the whole country on track. The National Solar Jobs Census from The Solar Foundation is the non-profit’s annual review of “the size and scope of employment in the US solar energy industry… [and] the most comprehensive and rigorous analysis of solar labor market trends in the United States.” As such, it’s a really important tool for assessing our job-creation progress in what had been, until the last two years, a key growth area within our energy sector. For 2018, the numbers are a mixed bag. Overall numbers for people employed in solar in 2018 stood at around 242,000—down 8,000, or more than 3%, from the year before. At the level of individual states, there have been winners and losers. California’s drop in solar employment alone (down 9,600) could account for the whole overall drop, though with 77,000 solar workers it’s still by far the biggest state for solar jobs (and #3 in solar jobs per capita). Massachusetts, which had been #2 in overall solar jobs, also lost—with 1,300 fewer people employed in solar—and dropped to #3 by that overall-solar-jobs metric. In all, 21 states lost ground, including 4 of the top 5 solar states by installed solar capacity (California, plus North Carolina, Arizona, and New Jersey). 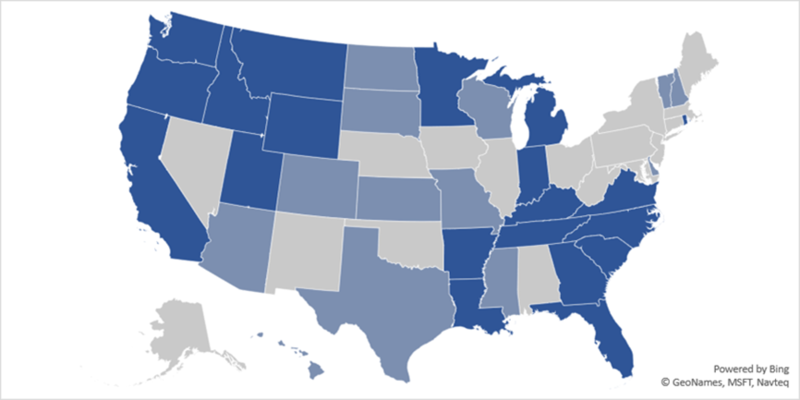 On the plus side, that still leaves 29 states gaining solar jobs. Those include Florida (up 1,800, to take the #2 spot for total jobs), Illinois (up 1,300), and Texas and New York (each up 700+). And the 2018 total solar jobs figure is still 16% higher than the 2015 number. But the annual drop—the second in a row—is concerning. So the next logical question is: Why are we losing solar jobs at all? State policies – At a more local level, states were certainly another piece of the pain, with uncertainty being the enemy of investment. California was figuring out what new high bars to set for itself in the climate and energy spaces. Massachusetts continued to wrestle with coming up with a worthy successor to its solar policies that had been so successful at building the local industry over the previous decade. 2016 – Another noteworthy factor is the industry’s own big push in 2016, when it looked like the sizeable federal investment tax credit (ITC) was set to expire; that led to a full court press by industry and customers, and a banner year. That helps to explain 2017 (as the market recalibrated a bit), though, and not necessarily 2018; with a supportive policy environment from the top on down, this past year could have been much stronger. One thing that doesn’t seem to be a reason for a drop in solar jobs is competition from coal. Given our president’s purported focus on jobs, and his (unhealthy) obsession with fossil fuels, you might well imagine that the job losses in solar have been made up in coal mining. The facts, though, say otherwise: The 1,800 new coal mining jobs from January 2018 to last month stacked up to less than a quarter of the 8,000 jobs lost in solar. Florida (the Sunshine State) has finally discovered solar power, as regulators finally began to let homeowners take advantage of solar leases, a financial tool which has been a powerful driver elsewhere. Illinois has been buoyed by the solar provisions in its important 2016 Future Energy Jobs Act. Texas is finding that large-scale solar’s really low prices are a good complement to its nation-leading wind fleet. Nevada is looking good after fixing a bad decision about net-metering a couple of years ago. Meanwhile, erstwhile leaders look to be getting back on track. California has a new requirement to put solar on virtually every new home, and a goal to get 100% of its electricity from carbon-free sources. Massachusetts finally has its new SMART solar incentive in place, removing the policy uncertainty for at least a little while. From where I sit, it seems pretty clear that any bold vision for our climate future has got to include a large role for solar power, with all its potential for cutting carbon, improving public health, enhancing resilience, empowering communities, and, yes, creating jobs. Getting us squarely on the path toward climate sanity will involve some tough choices. Solar isn’t one of them. Meanwhile, solar panel installer positions represent the fastest source of job growth in 8 states, according to Bureau of Labor Statistics numbers examined by Yahoo Finance. There are a lot of reasons to think that number of states should be a whole lot higher. Check out The Solar Foundation’s infographic for more facts and fun. Next Tuesday, Governor Gretchen Whitmer will give her first State of the State address as Michigan’s chief executive officer. It is a key opportunity for her to address climate change, infrastructure needs, and clean energy and water—all priorities Governor Whitmer emphasized during last year’s campaign. The U.S. Climate Alliance is a group of states committed to upholding the objectives of the 2015 Paris Agreement on climate change. Look for Governor Whitmer to highlight this week’s executive directive adding Michigan to the Alliance and the growing number of states in this coalition, which includes Minnesota and now Illinois whose new Governor J.B. Pritzker announced would also join. Governor Whitmer is also likely to highlight another executive directive from this week creating a Michigan Office of Climate and Energy. This new office will work with the governor to mitigate the impacts of climate change, reduce greenhouse gas emissions, and embrace more sustainable energy solutions. The sooner this new office can be up and running, the better, especially in light of the urgent and compelling need to act on climate change outlined in two key scientific reports released last year. Governor Whitmer’s campaign focused in on the need to improve Michigan’s infrastructure, including electric and heating systems in addition to roads, bridges, and clean drinking water. She also promised to “mak[e] sure Michigan has the edge in electric vehicles [that] will not only reduce carbon emissions, but create and protect jobs here in our state.” Ideally Governor Whitmer will outline specific goals and a policy agenda to further these critical needs and opportunities during her State of the State address. The Interstate Renewable Energy Council recently named Michigan to its 2019 Clean Energy States Honor Roll as its “Emerging Clean Energy Leader.” This is well-deserved as the Michigan Public Service Commission has launched several stakeholder processes to address regulatory policies facilitating integration of solar power in the state, including community solar and rooftop solar. In addition, last year Michigan’s two major electric utilities both announced important carbon reduction and clean energy goals. Many of the state’s old and inefficient coal-fired power plants have been retired, and there are plans to close additional polluting facilities in the coming years. Both Consumers Energy and DTE Energy have integrated resource plan dockets filed or to be filed in 2019 that, as I wrote about in my blog post last month, will be key items to watch on how the utilities plan to follow through on their goals. As a candidate, Governor Whitmer signed on to the Clean Energy for All Campaign, which asks candidates to commit to a vision where the United States runs on 100 percent clean energy by 2050. Governor Whitmer’s leadership on renewable energy and energy efficiency can help build on the state’s clean energy momentum and ensure Michiganders are benefiting from cleaner air and water, more affordable energy bills, and expanded economic development. I look forward to hearing how her remarks on Tuesday night will further the clean energy transition. Governor Lujan Grisham’s campaign included scaling a wind turbine and making strong clean energy commitments. Credit: Michelle for Governor (Oct. 2018), available here. For New Mexico, a state laden with clean energy opportunity but hungry for clean energy vision, such tall heights yielded a long hoped-for sight: a leader reporting clean energy potential as far as the eye could see. And though her feet are back on the ground, now-Governor Michelle Lujan Grisham’s eyes have stayed fixed to that horizon, using her inaugural address to double down on realizing the state’s clean energy potential by forcefully calling for policies that look up, look out, and establish a forward course. Over the past eight years, clean energy progress—alongside so much else—has been spinning its wheels in the Roundhouse. But now, with gubernatorial leadership there to help give it a push, the time is ripe to act. And if the already-filed legislation is anything to go by, legislators are ready—renewables, energy efficiency, electric vehicles, energy storage, transmission planning, and more. Or in other words: to the 54th Legislature, game on. In New Mexico, renewable resource potential abounds—the state is overflowing with sunshine, awash with steady wind, host to ample geothermal. Its universities and national labs are at the forefront of clean energy research, and businesses looking to capitalize on the transition are emergent. But policy vision and guidance from the state? It’s gone all but missing in action. As a result, though progress continues, it has slowed in the face of uncertainty. This has been a disappointing turn for New Mexico, which was not so long ago positioned among clean energy leaders, implementing a series of policies that catapulted its clean energy sector forward. Foremost among these? The establishment of a strong renewable portfolio standard (RPS), guiding utilities to incorporate a modest yet steadily rising share of renewables in their electricity sales, ultimately reaching 20 percent renewables by 2020—among the top targets of its time. But though formative in shaping a new and promising sector, the state’s RPS targets haven’t been strengthened since. Many of New Mexico’s one-time policy peers have recommitted themselves to the proven tool by lengthening and strengthening their own RPSs, but similar efforts in New Mexico have repeatedly stalled. The resulting policy vacuum could not come at a worse time. Because as is happening across the nation, New Mexico’s power sector is in the midst of unprecedented change as coal plants retire in the face of cleaner and cheaper renewables and natural gas. It is simply more expensive to operate old coal plants than it is to build these new resources, resulting in a wholesale shift away from coal. But the question for New Mexico—the massive, course-determinative question—is what gets built to take coal’s place? Renewables, or a lot more natural gas? Without a renewed RPS, the scale threatens to tip too far toward gas if the state’s largest power providers get their way. As a reflection of the policy’s central importance to realizing the clean energy vision, Governor Lujan Grisham made strengthening the state’s RPS the centerpiece of her clean energy plan. Such a policy is now poised to advance through the legislature, and its passage could not be more urgent. Because above all else, a long-viewed RPS sets a clear and definitive vision of where the state is heading, and establishes waypoints for staying the course. So as each decision arises regarding what replaces coal, an RPS ensures that eyes are to the horizon and investments are considered in context. What’s more, it signals to the nearly two-thirds of Fortune 100 and half of Fortune 500 companies with clean energy commitments of their own that New Mexico is the right place to invest. Critically, the value of an RPS is predicated on the appropriateness of its targets and the details of its structure. The current proposed legislation makes important updates to the policy’s design and has waypoints of 50 percent renewables by 2030 and 80 percent by 2040 for investor-owned utilities, and similar shares but slower timelines for rural electric co-ops. These targets are in line with recent technical and economic analyses by the Union of Concerned Scientists and the Natural Resources Defense Council, which independently found that such targets are not only technically achievable, but economically preferable, too. Indeed, both analyses concluded that such a steadily escalating share of renewables produces the least-cost option for the state—not to mention good jobs, significant investment dollars, and improved outcomes for public health and the environment. Unfortunately, the power sector is anything but a free market, and winning on the merits does not guarantee coming out on top. Utilities in the state are increasingly comfortable with higher levels of renewables thanks to the existing RPS: Public Service Company of New Mexico (PNM) has stated support of higher shares of renewables on the system, and Southwestern Public Service Company’s (SPS) parent corporation, Xcel, just declared its intentions of going 100-percent zero-carbon by 2050. However, major gas buildouts are still being discussed, meaning continued carbon and co-pollutant emissions as well as the threat of ratepayers facing another round of costly stranded assets not long down the line. With a strengthened RPS, there would be guardrails in place to buffer against such risks. The 2019 legislative session runs from January 15 through March 16. There is significant pent-up demand for progress on a wide array of issues, meaning legislators’ plates will be filled, and it’ll be a race to the finish to get things passed. Ensuring a just transition from coal: The shift away from coal is proceeding in New Mexico, bringing enormous benefits but also threatening to leave the workers and communities who have long been powering the state at a loss. With concerted effort, like supporting workforce transition, economic development, and targeted placement of renewables, the impacts of the transition can be dampened, and new opportunities can emerge. One potentially helpful tool is called “securitization,” which achieves lower-cost financing to facilitate the transition and consequently frees up funds that can be deployed to support development efforts. Increasing renewables deployment: A number of policies will be looking to boost uptake of renewables from a range of angles, including state renewables procurement, tax credits, increased access through community solar, workforce development, energy storage, and transmission planning. Changing energy use: Energy efficiency is the single most effective tool for reducing emissions and lowering costs. An update to the state’s energy efficiency standard will remove disincentives currently curtailing utility efforts; this change will lead to meaningfully reduced customer bills. So too will concerted efforts for energy conservation projects specifically supporting low-income customers, for whom energy costs represent a disproportionate share of income. Electric vehicles: Transportation is now the largest source of greenhouse gas emissions in the US, and the electrification of the transportation sector supports significant emissions reductions—and enormous public health benefits, too. The first step in the process is increasing electric vehicle uptake, which includes lowering barriers for purchase, and lowering barriers for use. In many ways, New Mexico is perfectly positioned for the moment at hand. The chance to be nimble in shaping what replaces coal persists. But this window of opportunity is closing, and fast. Major power project decisions are looming on the horizon, and the time is now to offer certainty on the path forward for investments and labor alike; to assure that the commitment to pushing the energy transition forward is here, and clear, and to the benefit of all. Photo: BLM Credit: Michelle for Governor (Oct. 2018). Understanding the limits of fossil fuels and the role of renewable energy supply is central to debates about transitions to more renewable energy. The Union of Concerned Scientists has provided plenty of reasons to avoid an over-reliance on natural gas, so the questions about how to replace gas with renewable energy are very important. Will building more windfarms mean less need for natural gas and natural gas pipelines? Yes. Wind in winter is a very good means to reduce the use of natural gas and the need for gas pipelines. Some claim the existing gas pipeline system is inadequate for our wintertime energy needs because of the recent increased use of natural gas (methane) as fuel for power plants making electricity. The crunch comes in winter, and shows as a gas pipeline shortfall in the Northeast because the majority of gas pipeline capacity is committed to home heating and other customers of the gas utilities. Without the addition of renewable energy in winter, the gas power plants will compete with the demand from gas utilities’ residential and business customers. Wind blowing offshore New England just gets stronger in winter. Fortunately, we have a great new industry arriving in the Northeast and Mid-Atlantic to address this issue under development: offshore wind. There’s strong policy support for well-financed offshore wind in the Northeast, and that turns out to be a great replacement for gas used by power plants in winter. We know this with some very specific information from a serious authority. The independent grid operator in New England, ISO-NE, recently published an estimate of how New England states’ commitments to building wind offshore would have produced energy and replaced natural gas. Specifically, ISO-NE look at wind data, electric demand and natural gas used in power plants for the cold weather period of December 24 2017 through January 8, 2018. This provides some impressive results. If 800 MW of offshore wind (the amount currently in permitting for delivery to Massachusetts), were in place, the ISO-NE study found, that amount alone would have avoided 9% of the natural gas used for electricity generation in that period. The offshore windfarms’ production in that cold snap would have been 70% of their potential, dramatically higher than the ~18% value used in most ISO planning efforts. While that 70% figure was impressive, the concept isn’t news to us at UCS. We’ve convinced grid operators and FERC that reliability estimates for winter underestimate the reliability benefits available from wind. UCS described in comments to FERC that physics dictates that power from wind turbines (and some other generators) is greater in colder weather because colder air is heavier. For the same windspeed, colder air will produce more power from the turbine and thus more energy. Data for the tens of thousands of existing land-based US wind turbines bear this out. Wind assessments and windfarm production tend to show higher production in winter than in summer. Wherever windfarms are built in the U.S., the total need for natural gas goes down. The arrival of offshore wind in the more densely populated East Coast offers this region a lot of renewable energy, and skilled jobs in the construction and operations. Debates over how to supplement the energy supply can not overlook wind. The details of gas vs. wind are much more critical. The gas industry has its own dynamics, and investments in gas can lock in decisions and climate impacts for decades. States along the East Coast have made the choice for new supplies from offshore wind. Now we have an alternative to gas that is renewable and carbon-free. Let’s get this alternative up and running. In many parts of the United States, power plant owners can get paid for doing pretty much nothing. You might think that power plant owners make all their money selling the electricity they generate. However, many power plant owners also get paid for providing “capacity,” or the ability to generate electricity. These types of payments are playing an increasingly large role in keeping fossil-fueled power plants operational, and finding cleaner alternatives is going to be a big challenge. The idea behind paying power plant owners for capacity is that grid operators want to make sure there is enough power to meet electricity demand if something unexpected happens (such as a grid emergency or higher-than-expected electricity demand from a heat wave). These capacity payments are a bit like paying for insurance – power plant owners get paid so that their plants are available to generate electricity just in case that electricity is needed. Interestingly, there are only a few places in the country where power plant owners do not get paid for capacity. For instance, in most of Texas, power plant owners only get paid for the electricity they produce. As a result, electricity prices skyrocket when electricity demand is at its highest, and those brief moments of sky-high electricity prices are what incentivize Texas power plant owners to have power plant capacity available to generate electricity. In California, the California Public Utilities Commission manages a resource adequacy program. This program obliges electricity providers (usually electric utilities) to pay power plant owners for electricity-generating capacity. System Capacity: These requirements help keep the lights on during the annual “peak load,” when California uses the most electricity. Peak load usually happens on a hot summer day when everyone turns on their air conditioning. The exact requirements are determined by forecasting the next year’s peak load and adding 15% just to be safe. Local Capacity: These requirements help keep the lights on in certain local areas during grid emergencies. For example, a grid emergency might entail a combination of a transmission line to a local area going down and a power plant in the local area going out. Different requirements are determined for each local area by studying worst-case-scenario grid emergencies in each area. Flexible Capacity: These requirements help keep the lights on in the evening when solar generation is winding down and people are starting to use more electricity after coming home from work. Because solar generation tapers off in the evenings when electricity demand is still high, these requirements ensure we have enough flexible resources that can start producing electricity quickly. These requirements are different for each month of the year, and they are based on the largest forecasted three-hour “ramp,” or increase in electricity demand. California’s resource adequacy requirements are important because they help ensure that the state has enough electricity-generating resources in the right places. At the same time, California’s resource adequacy requirements present a sizable challenge in the transition to a cleaner electricity system. These requirements are one of the reasons why California is slow to retire more natural gas power plants. For example, a recent Union of Concerned Scientists analysis found that local resource adequacy requirements keep a substantial portion of California’s natural gas power plant fleet from being retired. Thus, one of our biggest challenges in the state’s transition to 100% clean electricity is meeting these resource adequacy requirements with non-fossil fueled, electricity-generating resources. Battery storage will likely play a significant role in meeting California’s resource adequacy requirements. The right kind of battery in the right place can count towards many of these requirements, and the recent Union of Concerned Scientists analysis found that strategically putting batteries in the right places on the California grid could allow many more natural gas power plants to be retired. But it would take a lot of batteries to keep the grid operating reliably without any natural gas power plants, so we will need other solutions too. Another approach is to take actions that reduce the resource adequacy requirements altogether. For instance, California could incentivize strategies that reduce electricity use at certain times of day, which could then reduce system and flexible resource adequacy requirements. Or, California could build more transmission lines into local areas, which could reduce local resource adequacy requirements by expanding access to electricity generated elsewhere. Meeting California’s resource adequacy requirements through a variety of cleaner approaches – such as battery deployments, reductions in electricity usage, and transmission line upgrades – can help reduce our reliance on natural gas power plants while reliably keeping the lights on. There will be no single solution for this challenge, and we will likely need to take an all-of-the-above approach. But by reducing resource adequacy requirements and meeting those requirements with clean resources, California will be better able to achieve its ambitious clean energy goals.